At least they weren't shooting at us, I later told Division of Wildlife Resources pilot Clair Shaffer after we were safely back on the ground. I hadn't flown this close to the edge since covering the Vietnam war, where teenage pilots flew Hueys as if they were back in Modesto racing jalopies on a deserted road. I remember too well the low and precise seat-of-the-pants flying in 'Nam, and remember sometimes coming back with bullet holes in them. Last week, I went on a "bombing" mission in a Cessna with Division pilot Stephen Biggs. He was playing Mother Nature dropping fingerling trout into high Utah's Uinta Mountain lakes. It didn't take us long before we had dropped all our fish and began playing air tag with the other Cessna piloted by Shaffer so I could get some photos. finished dropping our load of fish. Stephen and Clair's flying was razzle-dazzle amazing, in and out of narrow alpine canyons and cliffs spectacularly up close and personal, palm sweating kind of flying. 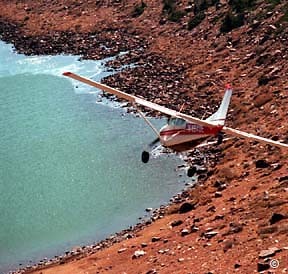 Some targeted lakes were just too close to the jagged cliffs, challenging the pilots' skills if they want to drop their fish in the lake and not on the shore. It requires ridge-following, tree-top flying skills that few pilots ever are called upon to practice, but I never saw either pilot miss their targets. The pair reminded me of those un-sung hero U.S. Air Force pilots who flew their own Cessnas and other small, slow planes in Vietnam. These forward spotters or observers flew close to the ridges and trees trying to find the enemy, and usually their first clue was hot enemy gunfire. Calling those pilots targets would have been more accurate. After our fish bombing mission, Stephen and I popped over a ridge on our way back to the airport and found ourselves staring at mass destruction. In the wide, long alpine valley below us, miles of trees littered the ground like so many thousand Pick-up Sticks. "It's not steep enough for an avalanche," I said over the intercom. "Could it be disease? "Probably a big wind," Steve guessed. Back at the airport, a DWR worker told me, "I understand it was the biggest tornado known to hit Utah." He said he'd been told it happened some years ago and was at least twice as powerful as the one that struck Salt Lake City in 1999. As we had flown over it, I told Steve, "I sure wouldn't have liked to been flying over here when that wind hit." A version of this story appeared in The Daily Herald.